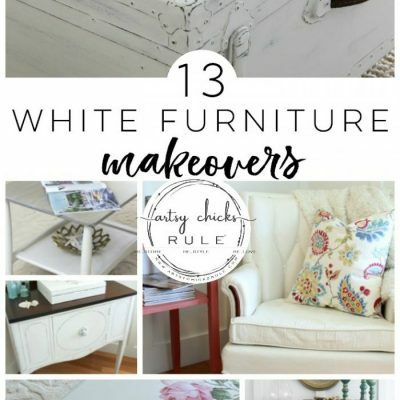 Every month my blogger friends and I get together to share a themed furniture makeover with you all. 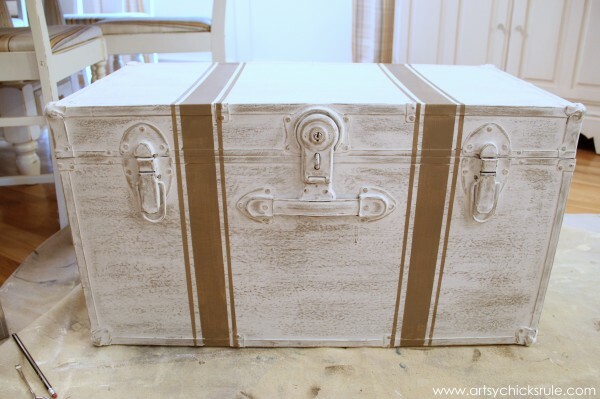 I’m sharing a Travel Trunk Chalk Paint Makeover today. Perfect for summer, right? Since so many of us doing exactly that. It was FREE, even better!! :) But not so pretty….before. You get the idea. Rusty old trim, laminate “wood” and plastic black handles. But I knew I could make it better with a little paint. 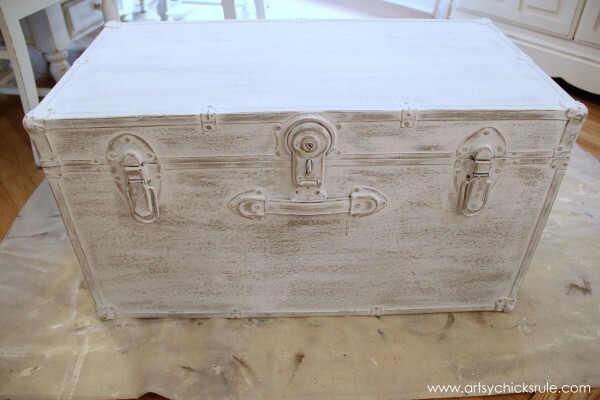 I painted the entire trunk with Sherwin Williams Adhesion Primer, metal and all. 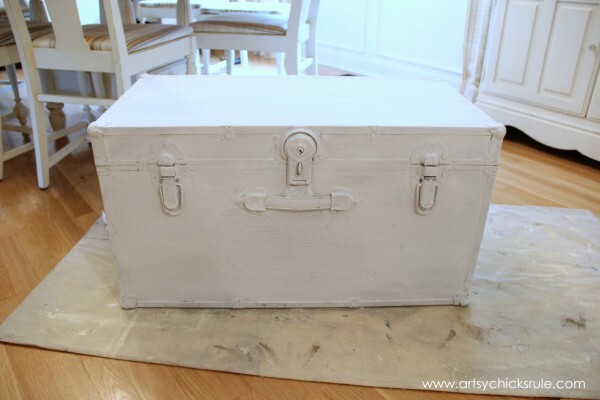 Next I put a layer of Coco Chalk Paint over that. I didn’t worry too much about application because it was going to get covered with more paint. 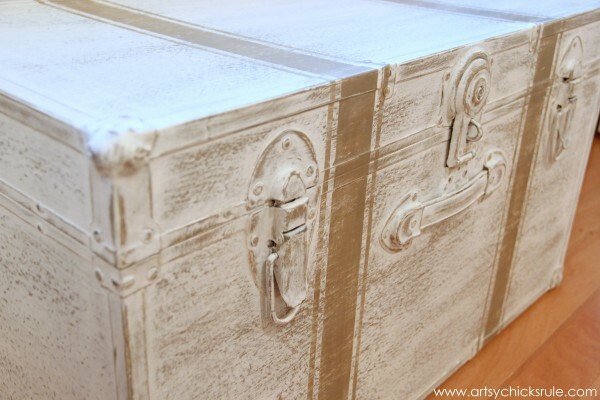 ….Pure White Chalk Paint (one coat) ….which got heavily distressed once dry. I wanted to really be able to see that Coco color underneath. I just kept sanding until it had the look I was after. Then came the measuring, tape and grain sack stripes. 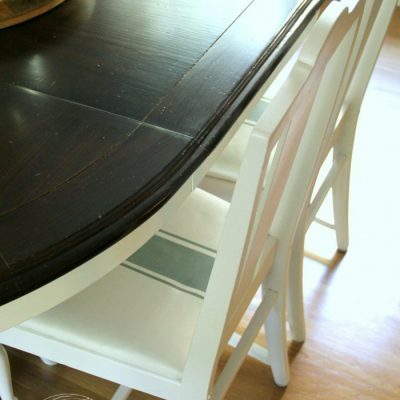 By the way, I sanded before applying the grain sack stripes because I wanted it heavily distressed. 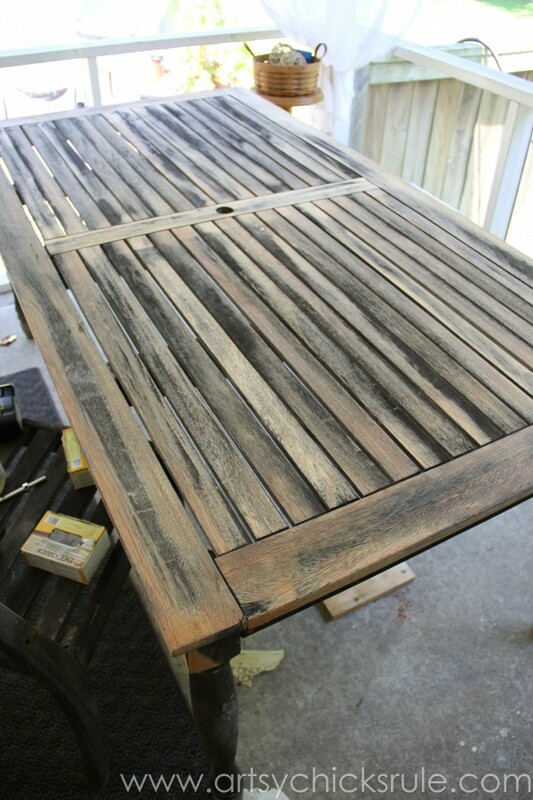 I knew I’d end up sanding the entire stripe away to get the look I wanted if I waited to do it all afterwards. Those stripes just made it, didn’t it? I sure think so. 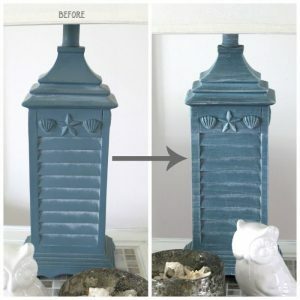 I distressed them up a bit and applied Annie Sloan Clear Wax. 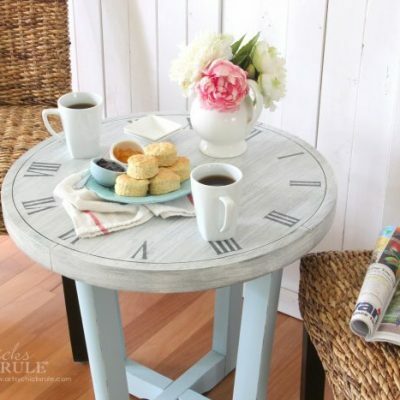 I just love all that Coco brown Chalk Paint peeking through everywhere. I’ll probably put this under the window of our Study or maybe even at the foot of our bed in the Master Bedroom. Either way, it’s a keeper. Amazing the difference a little paint makes. 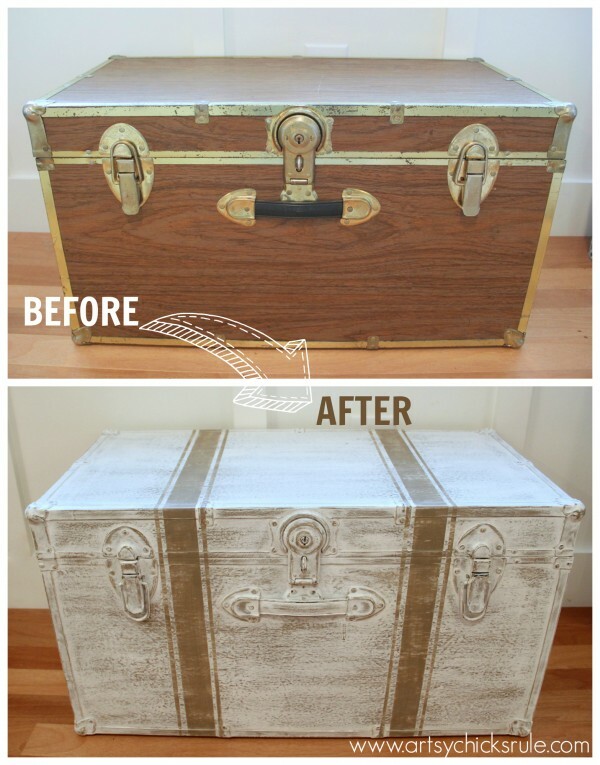 I painted it and I can hardly believe it’s the same trunk. 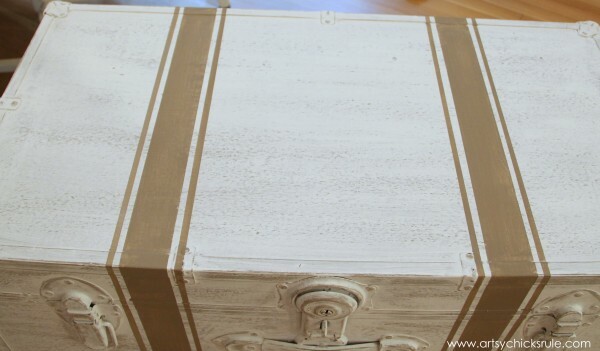 Loving this travel trunk Chalk Paint makeover! 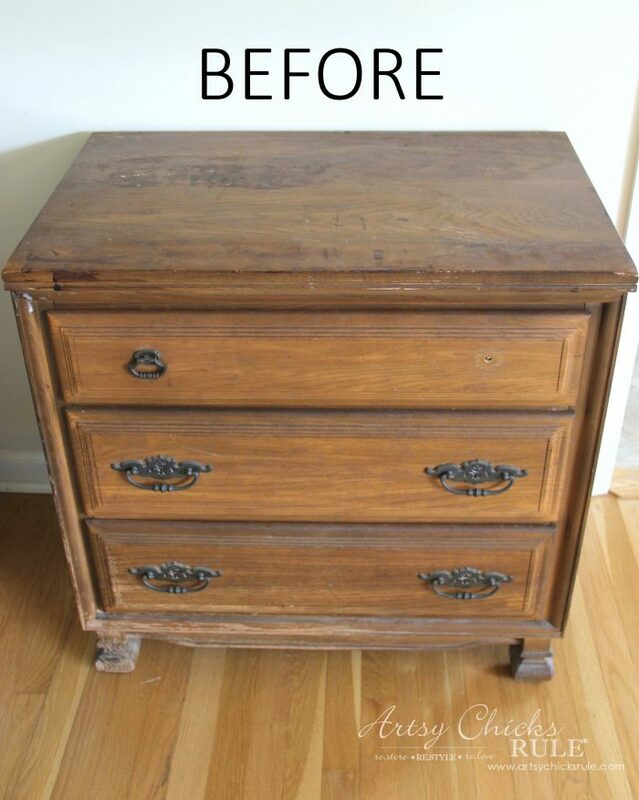 Be sure to check in next week when I share this makeover! UPDATE!! 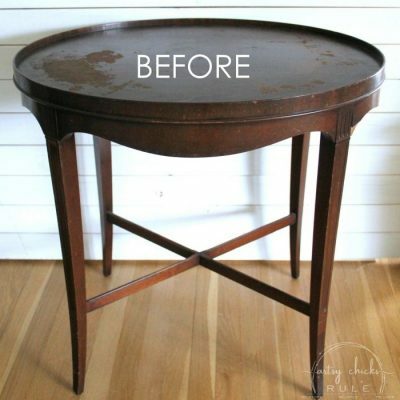 See how we rescued this old patio table now, here!! 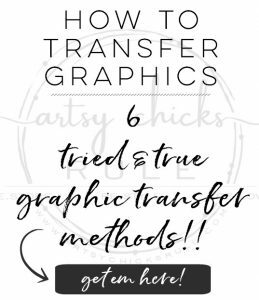 Don’t forget to take a look and visit my friend’s “travel” themed makeovers below! 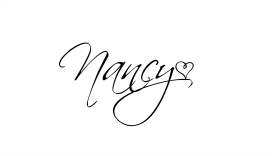 oh, I really like the travel trunk Nancy. You’re right the stripes totally make it. 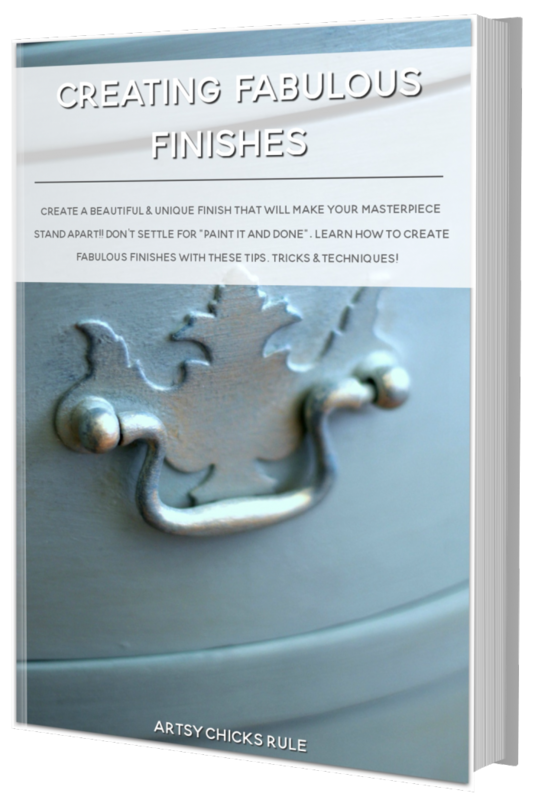 Just the right amount of distressing too! Oh, wow! That is fantastic!!! You are right the stripes really made it–it looks great and I can see why it’s a keeper now. Yes…it just needed those stripes, or something! I’ve decided it’s going in the bedroom! 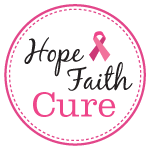 I just love this ….you did a wonderful job on this! 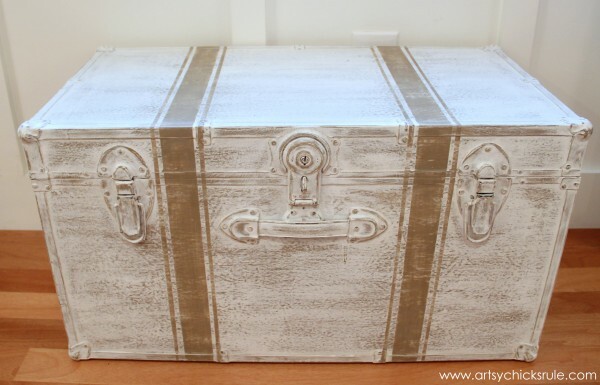 Wow Nancy, I love what you did with this trunk! I have one almost identical in my basement storage room. 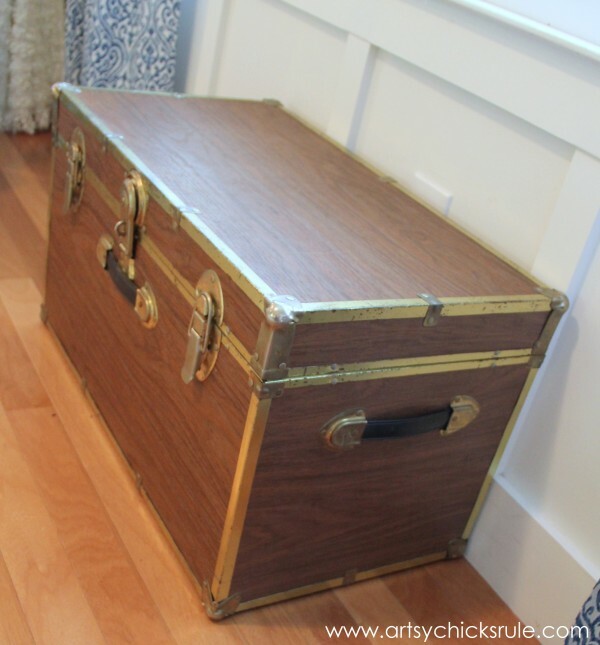 It was my “hope chest” back in the 70’s. 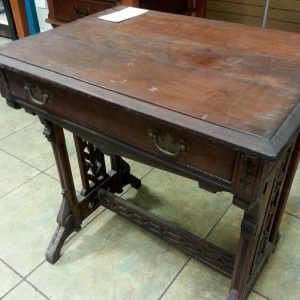 You may have inspired me to dust that old thing off, give it some chalkpaint and bring it upstairs in full view. Thanks for the inspiration! 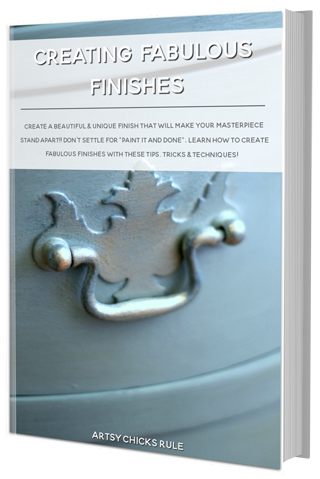 Oh yes, dust it off and paint it up!! This looks like a completely different piece! 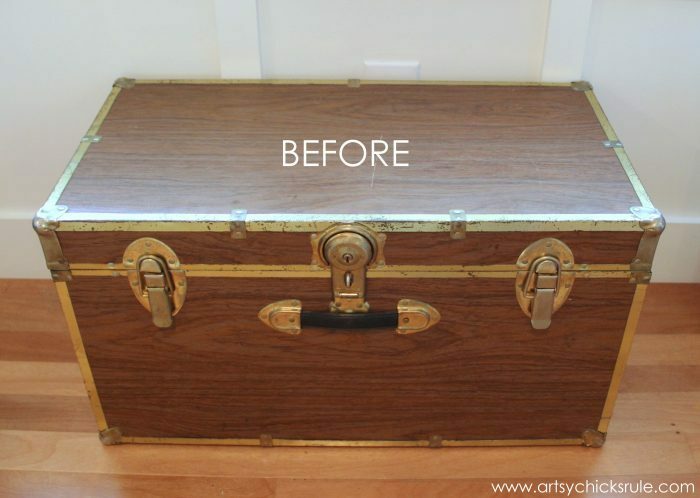 If I hadn’t seen the before picture, I would have thought you’d painted an old trunk. This will be great for storage. That’s exactly right…It is crazy how different something can look! Aw thank you Christy! :) Oh yes, make it pretty!! 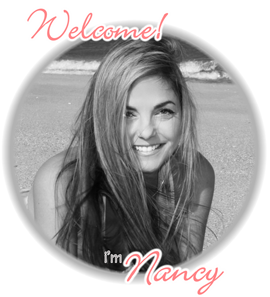 Wow, Nancy! 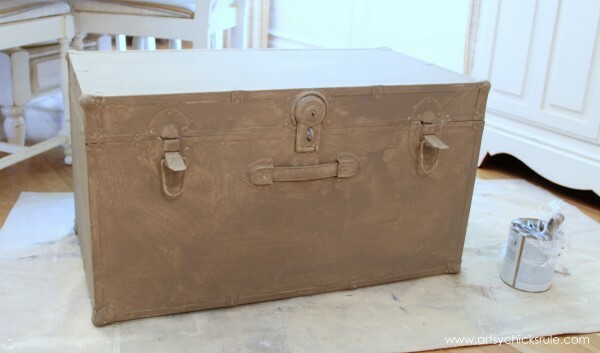 That trunk looks amazing! I wish I had it here in my house! 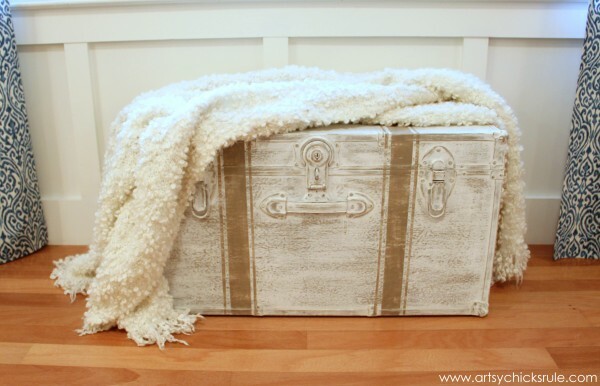 I’ve been looking for a bench or something to put at the foot of our bed… maybe now I’ll look for a trunk! How do u do the stripes?? I’ve gone over it many times, still can’t figure it out. Sorry, told ya it was dumb. 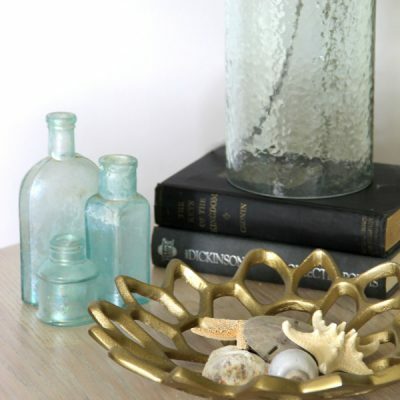 It may be a good thing that your first idea didn’t turn out because this one turned out fabulous! 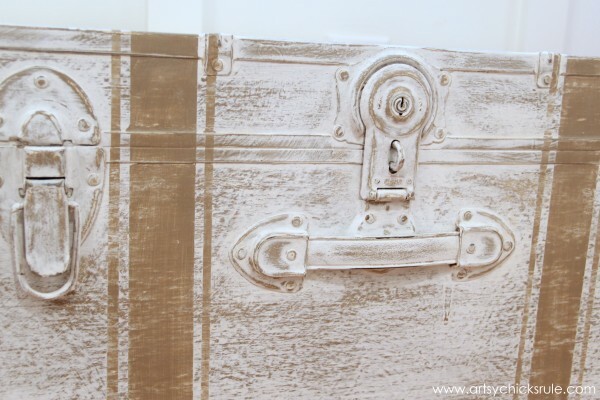 No one would ever guess it’s not really a wood trunk- it looks so aged and beautiful. 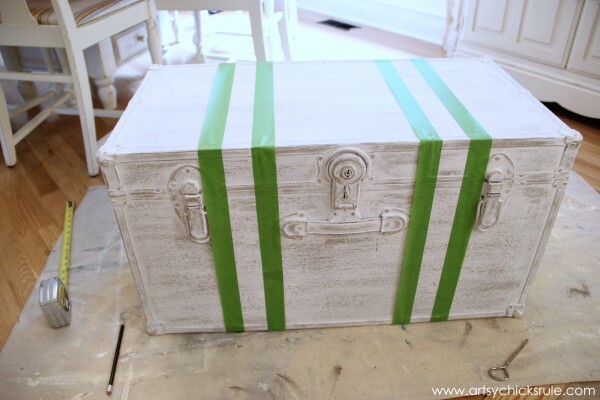 Great idea for adding the stripes too! I can’t believe it’s the same trunk! 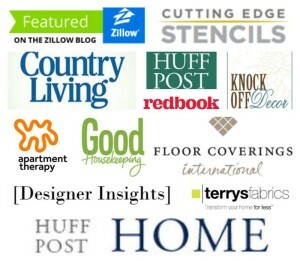 This project is a home run! Love it:) I might think twice before throwing some out we have in the garage now! Love it, I’m going to buy the next truck I see!